When Daniel Cormier gets the call to go fight, it never takes him very long to say yes, but he’s always curious about certain factors like who he’s fighting, when he’s fighting and what’s on the line. The latest offer he received to face Dan Henderson at UFC 173 in May was tougher to accept than you might think only because Cormier holds the former PRIDE and Strikeforce champion in such high regard. Considering that both fighters come from Olympic wrestling backgrounds before transitioning to MMA, not to mention when Cormier started fighting in Strikeforce it was Henderson who was one of the first guys there that helped him feel welcome in the promotion, he was doing his best to avoid fighting him. But with a list of top 10 contenders either already matched up, injured or coming off a loss, Henderson ended up being the perfect opponent for Cormier. Now he has to beat up a guy he considers a legend and one of the greatest of all time. It’s not ideal, but Cormier knows it’s just a job. Cormier also knows adding Henderson’s name to his undefeated record is exactly the kind of marquee win he needs to boost himself in the light heavyweight division. "You have to have that name. He has to be on your resume and you have to beat him. You don’t get that, there’s always going to be doubt. When you get that big, that high quality, fan interest win, that’s when people start to say that guy has something special," Cormier told FOX Sports. "I think when you talk about the greatest mixed martial artists of all time, Dan Henderson has to be in the equation. "He’s the PRIDE champ, he was the Strikeforce champ and he fought for the UFC belt. When you talk the best in mixed martial arts there is no one better than Dan Henderson, unless you’re talking about the champions that have reigned for a really long time. I think he’s one of the best there’s ever been and one of the best there ever will be." When the fight with Henderson was offered to Cormier it came with one extra bonus — the winner gets a shot at the UFC light heavyweight title. While facing Henderson wasn’t his first choice, Cormier couldn’t pass up the chance to win one more fight and then finally live his dream of competing for a UFC belt. It’s not the perfect scenario Cormier would have chosen, but there was no denying his excitement when the UFC said flat out this was a No. 1 contender’s bout with the title shot on the line. "Finally. The truth is I’ve never heard that before like ‘DC, you win this one and you get a title shot’. It’s always been ‘you’re getting pretty close’ so it does add a little excitement," Cormier said. Now the big question surrounding Cormier’s fight with Henderson and the looming title shot weighing on the result of this matchup is timing. Consider for a moment that Jon Jones will battle Glover Teixeira this Saturday night at UFC 172 with the title on the line. Just over a month later, Cormier fights Henderson for the top contender spot. The only problem is Alexander Gustafsson is already next in line to face the winner of Jones vs. Teixeira, which means at best Cormier with a victory in May could be sitting out eight to 10 months waiting for his title shot. UFC president Dana White strongly suggests fighters never sit out for any long period of time waiting for something, even for something as prestigious as a title shot. The thing is Cormier has been waiting for this opportunity for so long that waiting a few extra months will be worth it if he knows he’s going to compete for the title. Obviously there are extenuating circumstances that could change his mind — like for instance the champion getting injured and forcing everyone to get pushed back as well — but if the fights happen in a timely fashion, Cormier will sit and wait because fighting for the gold just means that much. "I’ve been after this for a really long time. I think probably at this point I probably should have fought for the belt before. A lot of things need to happen. Jones gets hurt and he’s out for a while, I wouldn’t want to wait a whole year. This will be my second fight in 2014. Two fights in a year isn’t bad, under normal circumstances I would fight two more times this year. In the last 16 months, this is my fifth fight. I’m averaging a fight every three months, but if it was my time to wait on a title shot cause it means so much to me, I would just go and just get better," Cormier said. "I’m going to have to be better. I have to be better to fight Jon Jones, and I have to be even better than I was before. I’d like to fight Dan Henderson and if I get through him, then I would like to fight for the title. If I have to wait a little bit longer, I’ll just get better." 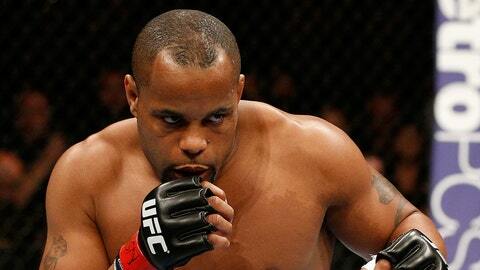 Cormier waiting for a title shot means the rest of the division will just have to rally for the No. 3 spot behind him and Gustafsson. That includes Phil Davis, who has been quite vocal lately about wanting to earn his shot at Jones after UFC 172 concludes on Saturday night in Baltimore. Sorry, Phil — Cormier says wait your turn. "One thing that needs to happen, Phil Davis needs to be quiet," Cormier said. "He needs to stop barking. I’m next buddy, chill out. He better wait his turn. He better stand behind big brother."